Responsive websites, branding and marketing - all under one roof. Creative Marketing & Design pours over 10 years of experience into every website and marketing campaign we work on. We recognize that each client has marketing needs that are as unique as their brand. We also recognize that every business has a different budget and has a different set of goals. Operating out of boutique shop in a historic little town, CM&D is often able to offer reasonable, market rates for high quality work. Every website is built around a fresh strategy for your unique audience experience. We look at who your competition is, what about your brand works and then create an impactful design and online sales path that will convert visitors into buyers. It’s more than just a website, it’s often your first conversation with your customer. We excel at e-commerce, initial coding for search engine optimization, content marketing and copywriting strategies. From the landing page to the entire user experience, Creative Marketing & Design knows websites. From logo creation to managing all of your print and online advertising, CM&D has done it all for over 400 Southern Oregon businesses. CM&D is comfortable working on any size project. Our ultimate goal is to design every campaign with your sales and customer loyalty in mind. In the beginning of 2009 Laurel Briggs founded Creative Marketing & Design and opened an office in downtown Medford. With offices now in Jacksonville, CM&D provides web development & design, marketing planning, and design services to over 400 local and out-of-area businesses, individuals, government entities and non-profit organizations. Whatever your industry is, we thoroughly research your audience and create a plan to bring you exposure and accessibility to your clients. If we don’t think that we can help you, we won’t. Because we are more interested in a job done well than a job done. Want to stand out from the rest of your competition? We know how to get you noticed. We tap into that makes your brand shine. Whether you are developing your brand or you are ready to launch a product or service, we have a unique perspective into discovering what about your company your clients should or do love. There is a lot more to a website than just good web design. We first discuss your business goals, research your target audience and strategize our approach to content. How do you want your customers to feel when looking at the website? What action you want them to take? Websites are marketing tools and virtual sales-people for your business. 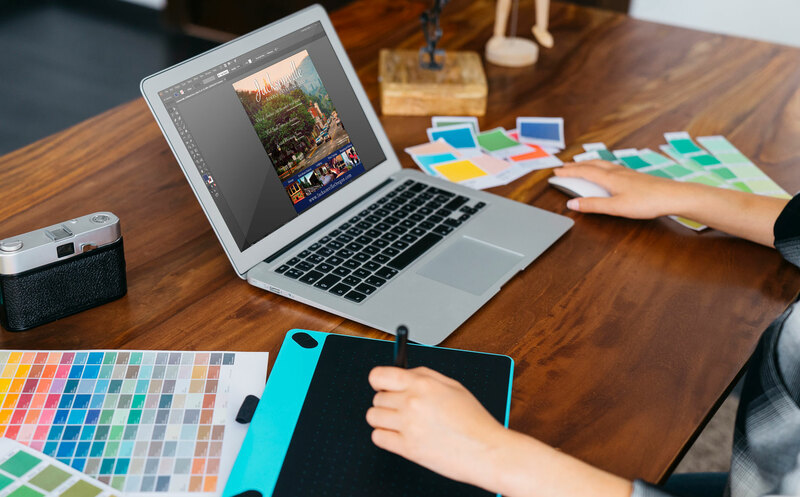 With professional design and a strategy in place we focus on getting traffic to your website and creating visitor confidence by presenting your business at its best.